Kostis Velonis, Turmoil of the blue, 2017. Installation View. Photo © Panos Kokkinias. Courtesy NEON and Kalfayan Galleries & Kostis Velonis (left) & Vassilis Oikonomopoulos (right). 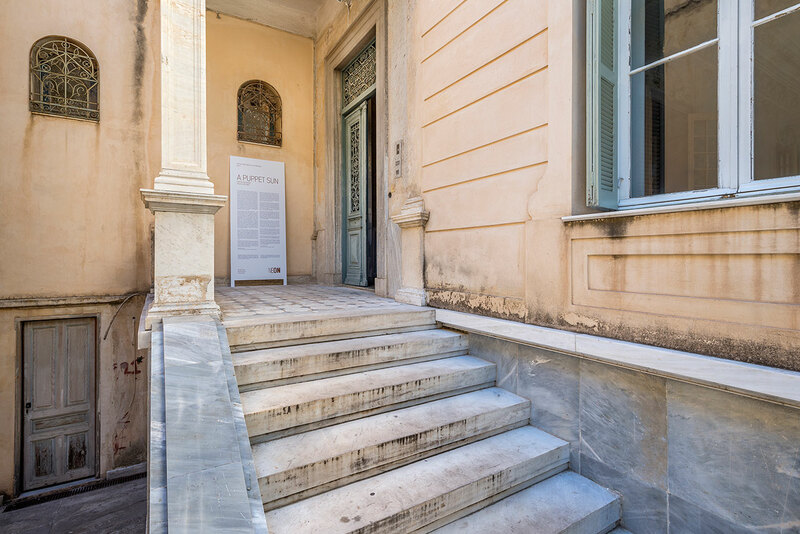 As part of NEON’s City Project, which aims to revitalize public and historical spaces through contemporary art, Greek artist Kostis Velonis was commissioned to revitalize one of the few neoclassical residences that still stand in the centre of Athens, Greece. Titled A Puppet Sun and curated by Vassilis Oikonomopoulos (Assistant Curator for International Art at Tate Modern), the exhibition mines the building’s rich context, a palimpsest of the country’s political, social and cultural history that dates back to the end of 19th century, for narratives and symbols which Velonis both incorporates and invokes in his pieces. Taking advantage of its layout, the artist has used the house’s levels in relation to their functionality to stratify his work in thematic groups that deal with social structures (basement), national and cultural identity (ground floor) and personal narratives (upper floors). Velonis is a scavenger at heart which makes his sculptural work seem even more like a product of excavation or discovery than creation. 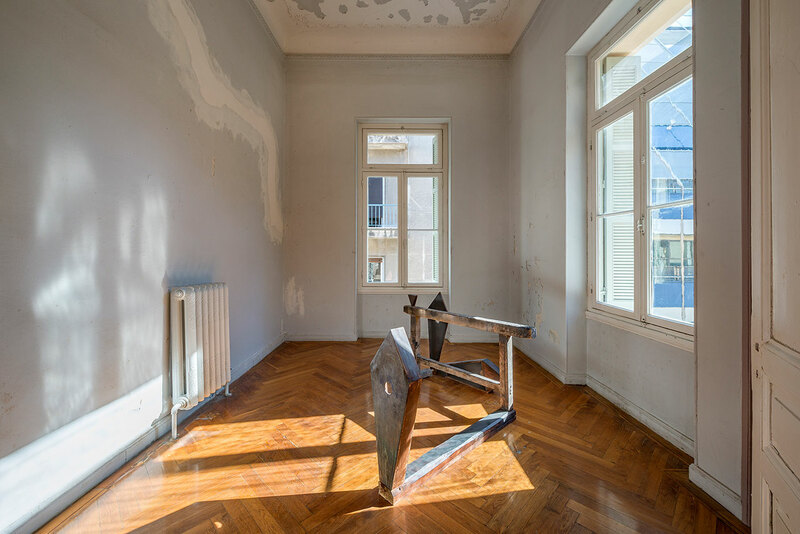 In the context of the house located at 11 Kaplanon Street, which has been vacant since the 80s, this quality gives his pieces a sense of belonging, as if they were made from the building’s own fabric or found there, stashed away by the ghosts of past inhabitants. Yatzer talked to the artist about his work for NEON, his artistic process and his literary inspirations. 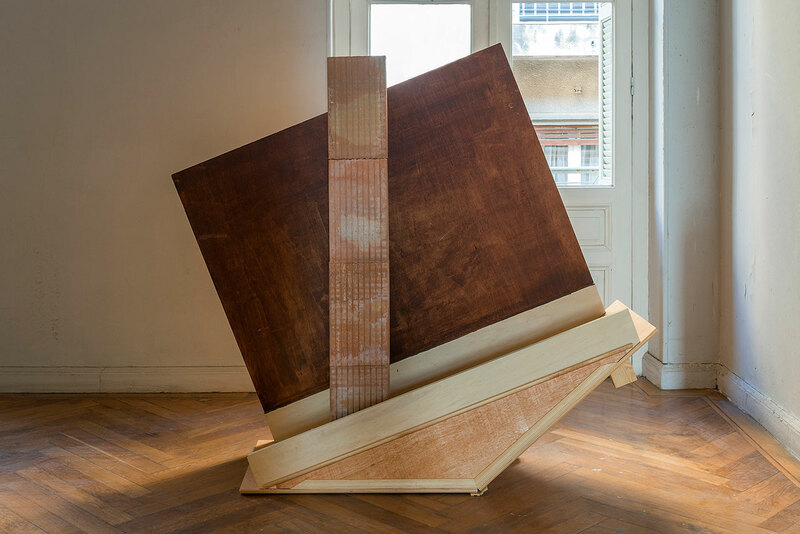 Kostis Velonis is represented by Kalfayan Galleries. Kostis Velonis, I See the Sign, 2017. Installation View. Photo © Panos Kokkinias. Courtesy NEON and Kalfayan Galleries. Kostis Velonis, A Puppet Sun. Photo © Panos Kokkinias. Courtesy NEON and Kalfayan Galleries. Which were the key elements of the house’s rich historical past that inspired your work for this exhibition? How much research did you have to do? What made the biggest impression on you both on an artistic and personal level? The key point for this show is Eleni Zouzoula-Kanelopoulos, who was one of the first female writers of children's literature and the wife of Apostolos Zouzoulas, a member of the parliament and founding member of the People's party (Ethniko Laiko Komma E.L.K). In most of Zouzoula's novels, people are encouraged to have a virtuous life avoiding temptation. Zouzoula is a well informed interlocutor who engages with diverse fields, from the socialist ideas of Platon Drakoulis and the activities of the animal welfare association, to the ideas of the theosophical society under the direction of Marina Diomidou. How did the building’s architecture, with its neoclassical opulence, rich decorative elements and grand size influence your work? Neoclassical buildings never formed direct part of my research but what attracted me was the fruitful presence of human stories in relation to the building. 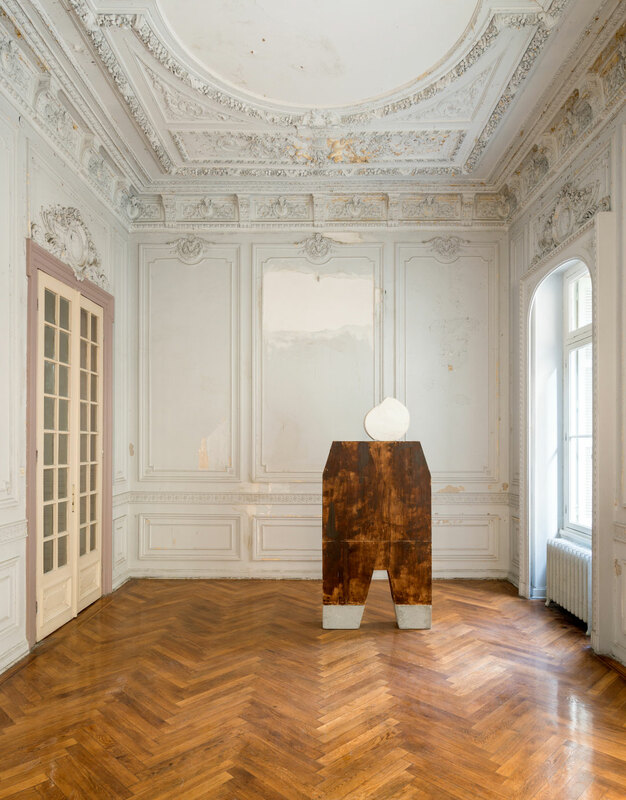 Kostis Velonis, The Ability to Keep an Upright Posture While Standing Still (Partial Reconstruction of Joaquin Garcia Torres toy figures as an Instrument of Research for politics), 2017. Installation View. Photo © Panos Kokkinias. Courtesy NEON and Kalfayan Galleries. 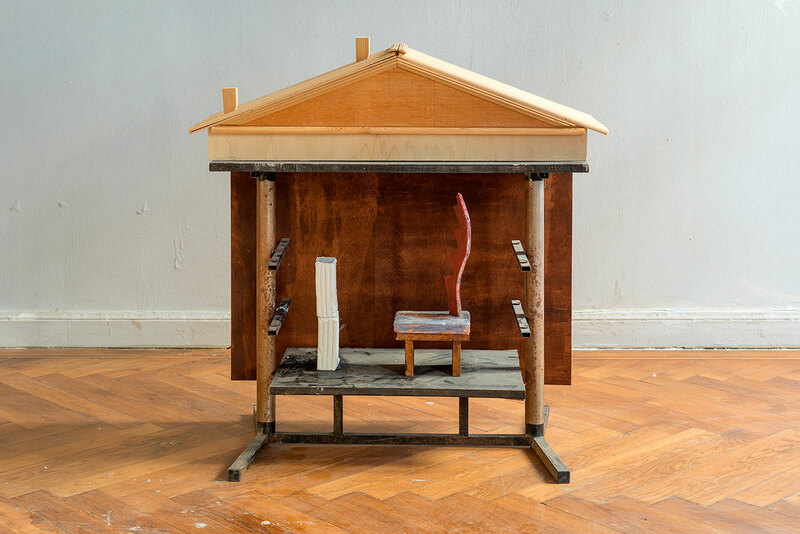 From left to right: Kostis Velonis, State of Suspense - 2017, The Ability to Keep an Upright Posture While Standing Still (Partial Reconstruction of Joaquin Garcia Torres toy figures as an Instrument of Research for politics) - 2017, Thinking on Your Feet (Partial Reconstruction of Joaquin Garcia Torres Toy Figures as an Instrument of Research for Politics) - 2017, Installation View. Photo © Panos Kokkinias. Courtesy NEON and Kalfayan Galleries. 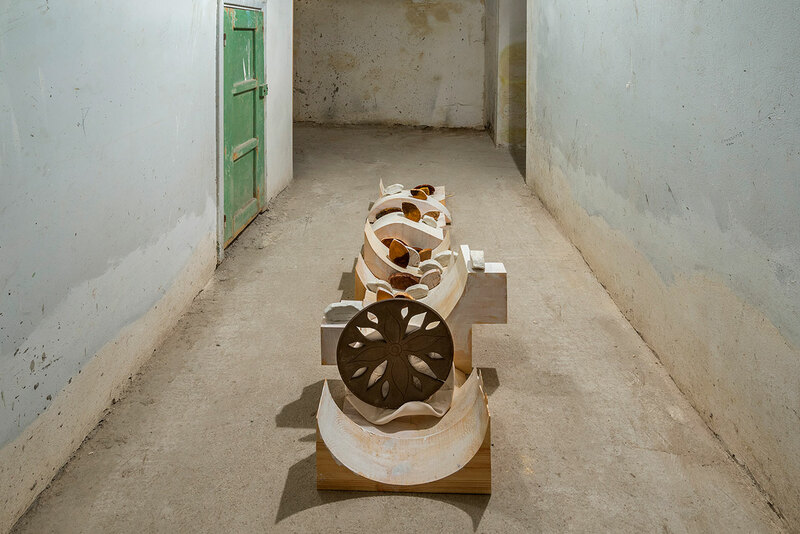 Kostis Velonis, Debate on Chimneys, 2017. Installation View. Photo © Panos Kokkinias. Courtesy NEON and Kalfayan Galleries. 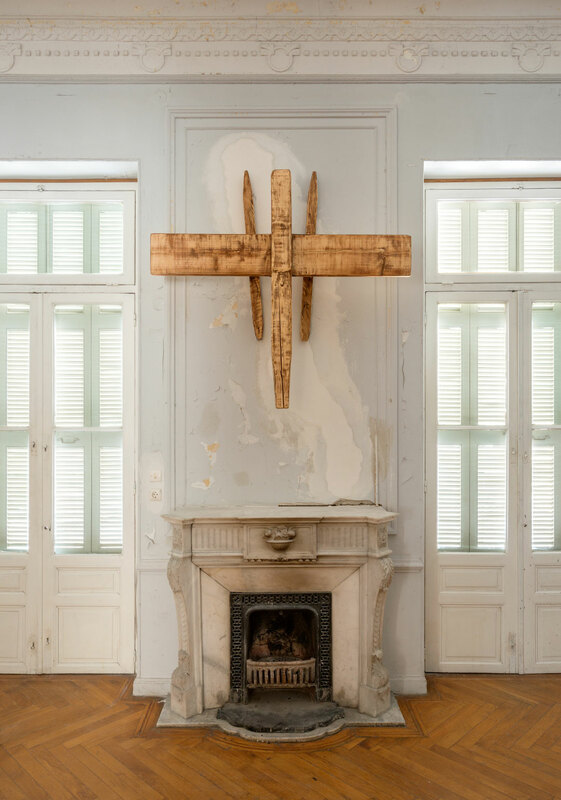 Kostis Velonis, Weathered, 2017. Installation View. Photo © Panos Kokkinias. Courtesy NEON and Kalfayan Galleries. When creating site-specific work as you did for this project, how do you balance the need for site-specificity with an aspiration for each piece to stand on its own? It isn’t my intention to create site-specific works exclusively. I cannot easily accept that my work be solely committed for a specific purpose. These works are autonomous while at the same time their point of departure has been the building and its stories. You have used a wide range of materials in this body of works, from metal and cement to wood and marble. How do you choose which media to work with? Does each material have a specific conceptual significance, and if so, would you say you have developed a kind of tactile language/alphabet? My process is based on the experience of scavenging and discovering, closely connected with DIY and bric-a-brac practices. Naturally not all the remnants of wood, steel, reinforced concrete, bits of clay and bits of marble are made available through the process of excavation but, their condition of deterioration as well as their texture may be reminiscent of an object that was discovered through this process, as something that may have also been found in the streets. I’m interested in a sort of 'ground sculpture' which is the same reason why I systematically avoid the commonly used plinths. “Base materialism” is the starting point for any negotiation with the matter irrespective of the ideas, narratives and principles that are invested in the object which this is why I continue to persevere with this medium. Kostis Velonis, We Keep this Flame, 2017. Installation View. Photo © Panos Kokkinias. Courtesy NEON and Kalfayan Galleries. Kostis Velonis, Hold me Tight, 2017. Installation View. Photo © Panos Kokkinias. Courtesy NEON and Kalfayan Galleries. Despite using sturdy materials for your work, many of your pieces exhibit a fragile quality or a tentative equilibrium; they almost look as if they could topple over if you touched them. Was this juxtaposition between their muscular materiality and their precarious composition intentional and, if so, to what purpose? To some extent, by adopting archaeological practices these constructions insist on the experience of incompletion, where the architectural fragment or the broken material reflects the natural ruin of human life, in other words, vulnerability and physical deterioration. 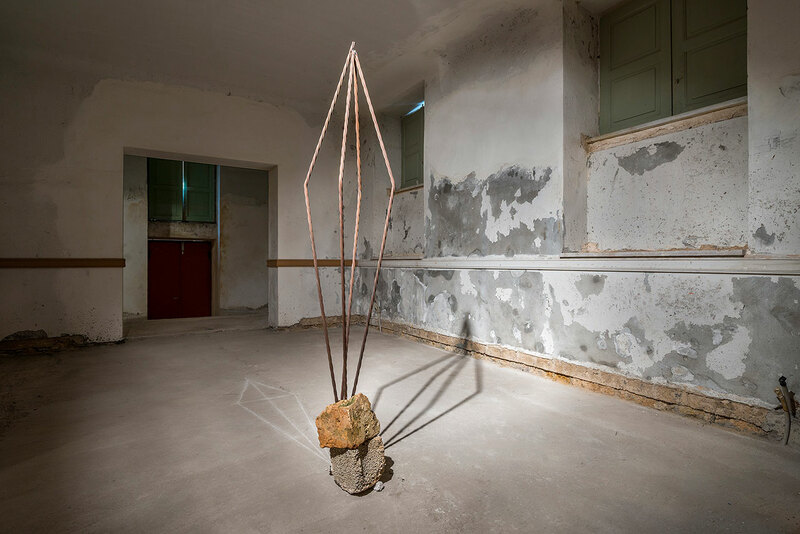 The works intend to urge us to contemplate on the natural deterioration of the matter while making visible a certain fragility of the construction which is connected with the sense of temporariness in our life. You have titled your work very lyrically, with a number of the titles resembling poetic verses. How significant are the titles? Is their purpose to provide viewers a key to the work's conceptual underpinnings? Yes, otherwise they would be numbered or untitled. Especially with this show, poetry is the hidden vehicle behind my works, which isn’t only restricted to the titles but also to the impact that literature has had on the works as a tool for inspiration. Andreas Kalvos, Hölderlin and William Blake, but also modern poets like Amy Lowell, have helped to activate conceptually some of the pieces. Kostis Velonis, Dead Feathers Unfolded, 2017. Installation View. Photo © Panos Kokkinias. Courtesy NEON and Kalfayan Galleries. 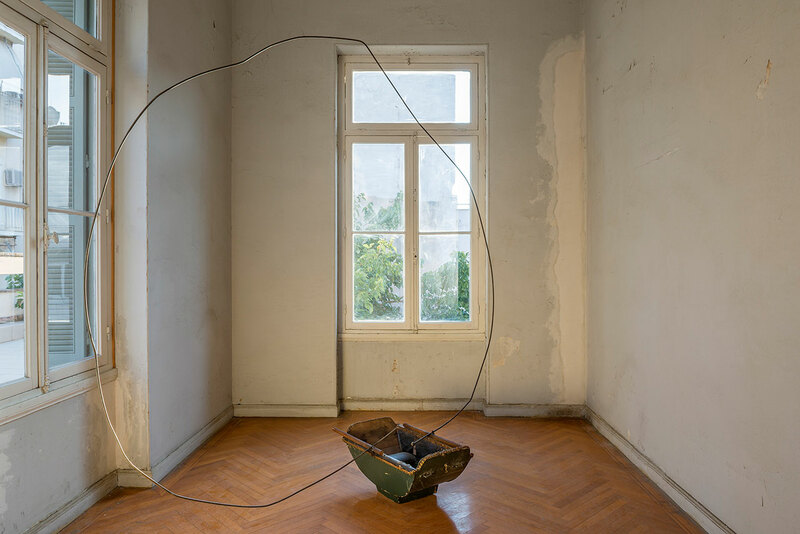 Kostis Velonis, Days Left, 2017. Installation View. Photo © Panos Kokkinias. Courtesy NEON and Kalfayan Galleries. Kostis Velonis, You Glow in my Heart like the Flames of Uncounted Candles, 2017. Installation View. Photo © Panos Kokkinias. Courtesy NEON and Kalfayan Galleries. Your work abounds with formal and conceptual ideas as well as context-specific references. Do aesthetics play a role in the creative process or are you mostly guided by conceptual criteria? One can accept that in most cases the gesture is stronger than the production of meaning in the realisation of an artwork. We can be attracted by the aesthetic gesture and I think it is worth mentioning Baudrillard's interpretation of seduction here as he lets us think of and understand seduction as a game, a plot that slows down, postponing the acquisition of meaning. Seduction moves faster than conceptual connotations. Do you believe that the onus is on the viewer to decipher the artist’s intentions or on the artist to communicate his ideas? How much, if at all, should the artist or curator assist the viewer through explanatory texts etc. or should the viewer be left to develop his/her own interpretation? I definitely believe that the viewer should be left to develop her/his own interpretation, as after all the artist's intentions are open to hermeneutics. I am interested in a dialogue that comes about through the politics of difference. In aesthetic terms, this dialogue starts with the very formation of the form, the conflict of the shapes, the turbulent aspect of matter, the "second" narrative (in a dominant direction), the insidious heterochromia in a seemingly monochromatic work, or even the differentiation of the title in relation to what it shows, which often connects the tragic with the comical. 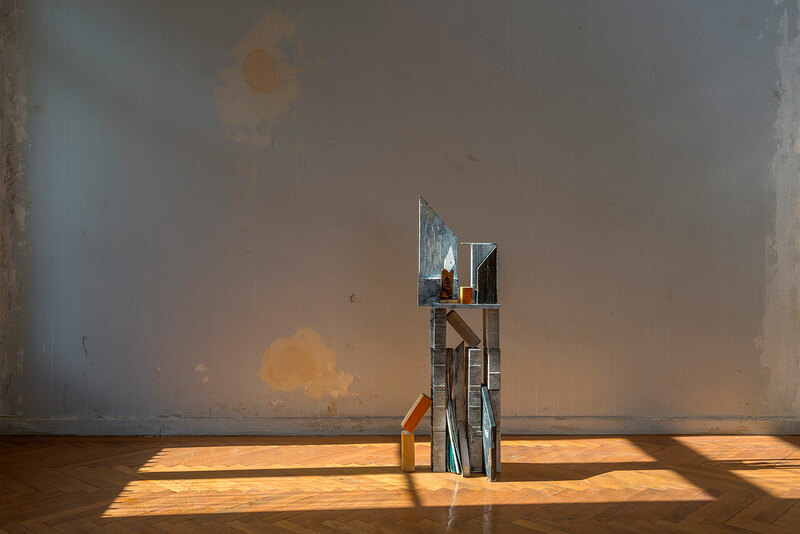 Kostis Velonis, Puppet Sun, 2017. Installation View. Photo © Panos Kokkinias. Courtesy NEON and Kalfayan Galleries. Kostis Velonis, Killing me Softly, 2017. Installation View. Photo © Panos Kokkinias. Courtesy NEON and Kalfayan Galleries.